A sequel to the CAPS Locked In episode about this Hail Hydra business, the whole crew talks about the news and subsequent reveals. Make Captain America Great Again! The next installment of The Punchin’ Bag on Tumblr. Check out all of the Gentleman & Scholar Comics. Oh yeah, and something on Netflix, etc. Tex Arkana #1 Available Now! 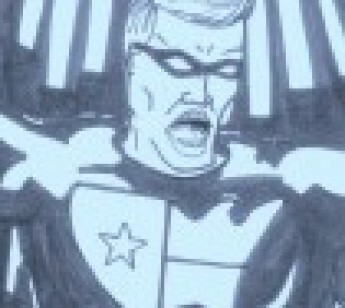 Gentleman & Scholar Comics presents its first full collaboration comic book, Tex Arkana. Learn Tex Arkana’s origin as he struggles with his past, at the expense of his present. There may be hope for his future, yet. Click here to get this black and white comic book on Indy Planet! The entire Gentleman & Comics line is on Indy Planet as well! In the wake of Captain America: Civil War, I was left wondering about the future. Could we have a Dark Reign/Thunderbolts movie in our future? The pieces are there, if you look for them. Just a little fan theory to get off my chest. What If Colors on Tumblr! I put up some re-colored What If covers over on a Tumblr at whatifcolors.tumblr.com/. For instance, this is What If Infinity: Inhumans from this fall. It didn’t make it into the episode, but most of what I post does. It’s a little silly play with color, if you’re interested. WIP Christmas Spectacular 2015! – On YouTube! The What If Podcast tells glories of Christmases long long ago, or at least a Top 7 countdown of Christmas Comics podcast-co-host The Franchise owns! Including the one and only Great Lakes Avengers! Plus a dramatic reading of “I’ll be Doom for Christmas” from Marvel What The–?! #10.